The Nintendo Revolution still lacks an official name. Nintendo will likely rename the console in May at E3, but chances are they’ll come up with a less than stellar moniker. Luckily, I am here to suggest names that are sure to be winners in the court of public opinion. Of course I’ll expect royalties. Gamecube 2 – The most obvious and worst choice. Similar to Sony renaming the Blu Ray discs BETA Max 2. 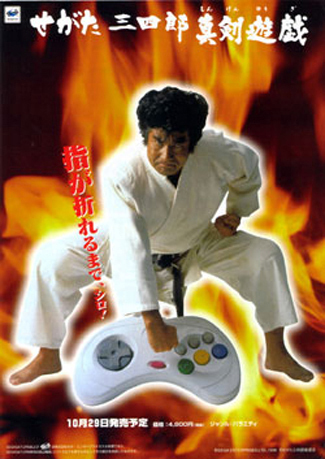 Nintendo 540 – The new Xbox thinks it’s xtreme and in your face, but a 360 is a pretty easy move in most new extreme sports other than freestyle walking. Besides, a 360 leaves you facing the exact same direction you were prior to the move, which explains why the new Xbox is also tanking in Japan. Nintendo can show the kids that it can be more to the max than Microsoft and also hint that they’re taking gaming in a new direction with a catchy name like 540. I’m not Picasso, but I do a little freelance design on the side. Nintendo would be wise to contact me. 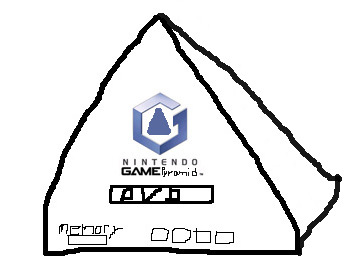 Game Pyramid – May require some slight alterations to the consoles case, but Nintendo and MS have both proven shapes are sure sellers. DS2 – This name takes advantage of the DS currently running the Japanese government. It is grossly misleading but then so is naming every RPG you make Final Fantasy. Nintendo Otter – Will please under water life fans and those still waiting for the Dolphin. NES V – Similar to the DS2 name, but sounds a little less like PS2. It is also a call back to Nintendo’s hey day before the US government realized their third party policy was illegal. Plus, it’s two more than any other next gen system. Project Point – Everyone loves alliteration, and this name is pretty accurate. If we’re going to have to see hundreds of more Nintendo ads with people posing and pointing they might as well come clean: it’s not a Revolution, it’s pointing. Nintendo 125,829,120 – Forget 3, 5, and all other tiny numbers. If Nintendo wants to counter the claims that the Revolution is weak hardware wise, they only need to name the console after the amount of RAM it has. People will come to respect the system’s might after saying “Nintendo one hundred twenty five million, eight hundred twenty nine thousand, one hundred and twenty” a few times. Also, it’s 125,829,117 more than those other systems. Nintendo Evolution – Not a bad sounding name and possibly the closest to the truth in describing the system. Fear a backlash in Kansas. How about the Okama Gamesphere? Who cares if south park already used it? How about, “Nintendo’s x-treme family fun entertainment center game station happy box extraordinaire 2000 system”? I think it covers just about every demographic they would want to reach. I take offense to that Kansas comment. Project Point is so much better. Okay, after a few hours of just thinking ????? in huge font, it has sort of percolated into my mind and here is my impression. Wii is a big risk, because while it is balanced, well thought out, simple, international, and has sort of a bright, fun sound, it has two big drawbacks in english. One is that almost no words end in ii. I haven’t been able to think of any other than genii. It looks weird, and almost incomplete. The second is that the sound “wee” is associated with piss, and this is where the big gamble comes in. If they can get enough saturation, and we hear Wii enough that we stop associating it with piss and start thinking of it as its own word, then it may well be one of the more brilliant names I’ve ever heard of for a console. If not, then it will forever remain piss and it will be a serious marketing mistake. This is similar to the word blog for me. I hated it when I first heard it, because it associated in my mind with “blob” and “glorb” and other nasty-sounding otomotopeia like that…but now it’s gotten to the point where the word blog has its own context in my mind, and those associations are gone, because blog has become such an everyday word. Now, for instance, I associate blog with whiny emo kids, biased ranting, and bad poetry/song lyrics. See? A complete shift. Nintendo is taking a lot of big risks with this console, wii shall see if it pays off for thiim. It claims the whole Wii name is a hoax and I want to believe it. I want to be able to say videolamer was not fooled if it turns out the hoax claim is right, but then I also don’t want to look like a fringe nut job who thinks the moon landing was faked. So for now I’ll believe Wii is going to be the systems real name, but not with much conviction.